Through Yanguimun is Gyotaejeon, the Queen's living quarters. It might seem strange for the queen to have separate living quarters from the King, but King Sejong decided (when he getting on a bit) to carry out his executive duties from his living quarters (Gangnyeongjeon). So to let the Queen have a bit of peace and privacy from all the visiting officials, Sejong built Gyotaejeon for her. Gyotaejeon is one of the few buildings that you are allowed to enter. 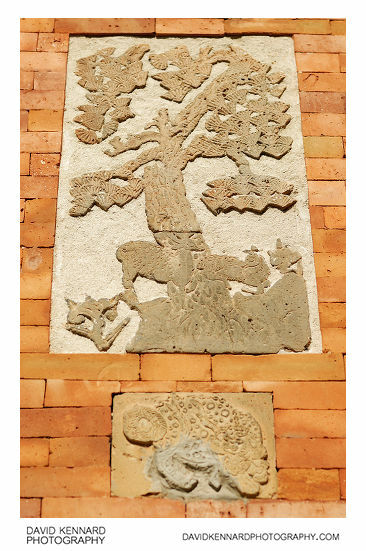 Behind Gyotaejeon is Amisan Garden, which can be accessed via the Hamhyeongmun gate. 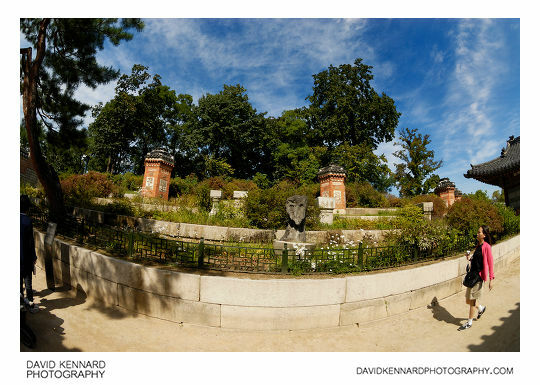 I did try defishing this image to both equirectangular and rectilinear projections, but I prefer the fisheye version best. Amisan Garden is named after Mount Emei, one of the four sacred Buddhist mountains of China. The garden and mountain are named '峨嵋山', 'Emeishan' in Chinese, or 'Amisan' in Korean. 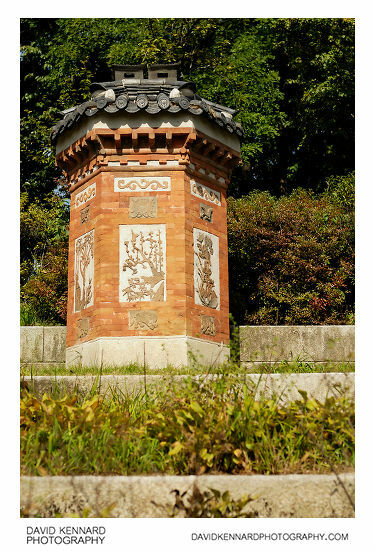 It is built on a mound of earth, created from the excavation of the nearby pond that surrounds Gyeonghoeru Pavilion. 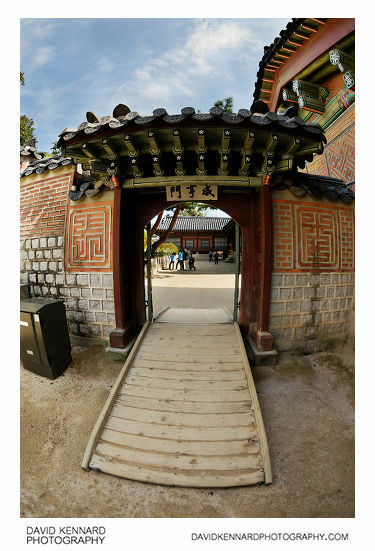 You can see a nice 360 VR of Amisan by Min Heo on 360cities.net. 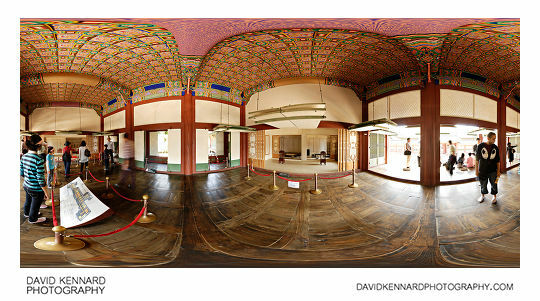 Many of the palace buildings use an underfloor heating system known as 'Ondol' or 'Gudeul'. A fire would be lit, and then the smoke from the fire was channelled under the building, heating the floor. The chimneys used for expelling the smoke after it had flowed under the building are quite different to the sorts of chimneys I'm used to though. Although obviously connected to the building underground, the chimneys aren't directly connected to the building. The way they are built and decorated you wouldn't know they were chimneys either.